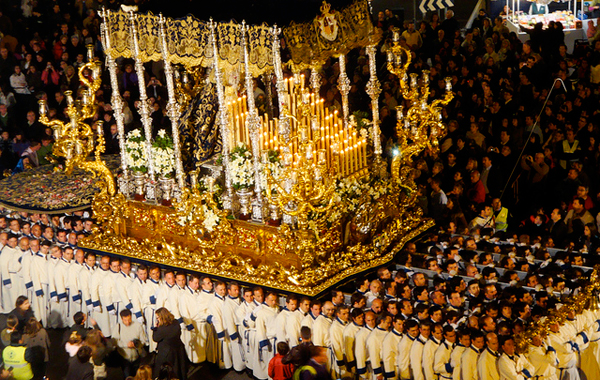 The whole Semana Santa experience on the Costa del Sol is steeped in over 500 years of traditional history. It’s acted out before your eyes on the streets, as if it were live theatre, in the weeklong event. The procession is incredibly emotional. You cannot fail to be emotionally moved during the Easter Week on the Costa del Sol. All over towns and villages, represent the festival with passion and religious devotion. Holy Week is one of the most important religious and cultural events in Costa del Sol and a huge drive for Tourism in these parts. Some of the most spectacular parades in Spain are in Andalucía. The weeklong event begins with Palm Sunday processions and ends the week later on Easter Sunday. This year the dates for your diary are from the 13th April, Palm Sunday until the 20th April, Easter Sunday. Although on the Sunday there is no procession. Let’s hope the weather holds out, this time of year is notorious for rain and has sadly seen the event cancelled. In 1921 the “Malaga Holy Week Brotherhoods Association”, was created. Political and social reasons of unrest put a stop to the procession in 1931, a few they named ‘the brave’, reformed in 1935, only to stop again at the outbreak of the Spanish Civil War. A slow recovery, but none the less a triumphant one as of today. It impacts hugely on the income of tourism. Visitors amounting to over one million people flock to Màlaga for Semana Santa (Easter); this includes the Spanish as well as foreign visitors. Màlaga demonstrates on a grand scale the level of seriousness of the whole event. The music sombre and the scent of incense filling the evening air. It literally is a spectacular event full of ornate and luxurious works of art, depicting scenes of THE PASSION, the suffering of CHRIST, before and during Crucifixion. Antonio Bandaras takes part in processions at Easter in Malaga. Members of Nuestra Señora de la Esperanza are dressed in robes depicting different religious brotherhoods. The Nazareno is a tunic and hood, hiding the face of the person wearing it, others in cloaks or uniforms not dissimilar to that of soldiers of ancient Rome. On the shoulders of generally between 24 and 48 men the floats (tronos), of religious icons are transported through the streets. Don’t underestimate the weight of this feat, some of these floats weigh in over 5,000 kilos and carried in total by over 250 men. From balconies you will witness the singing of ‘saeta’, the religious song sung by the saetero, with elements of Flamenco; translated as ‘arrow’ ‘, ‘bud of a vine’, ‘hand of a clock’ or ‘magnetic needle’. The intensity of the emotion is not hard to miss; it fills you with an overwhelming sorrow. Antonio Bandaras, a son of Màlaga himself has been known to participate and share the load of these floats on his shoulders. For a more insightful explanation and to see all the glory of the floats up and personal you can head off to Málaga to the ‘The Holy Week Museum’ (Museo de la Semana Santa). The building itself has an Andalucían patio and within the Church itself you can view the 17th century Baroque works of art, by the Málagueño artist Juan Niño de Guevara and the costumes worn throughout the processions. There is also a viewing room with videos of the processions, in English & Spanish.